This is a en E6-B sliding rule in the shape of a keychain. The diameter is about 1.7 inches and it's flat so it goes well in a keychain or inside a wallet. It is made in plastic but might suffer wear or break if carried in a keychain with keys and other abrasive elements so maybe better for a slim keychain, the car keys or a wallet. 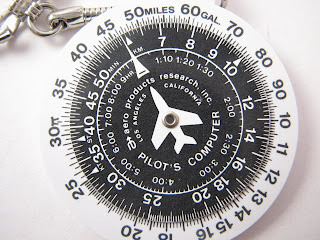 The sliding rule is used by pilots to perform manual calculations about fuel usage, time to destination and others it's basically a decimal logarithmic scale and can be used by non pilots to do multiplications, divisions, square roots, percentages, unit conversions and proportions. To perform a multiplication you just align the first number from the inner scale with "10" in the outer scale, then look in the outer scale for the second number and the inner scale will show you the result. The precision is not very high because of the size, you will not know about decimal values in divisions and your multiplications and proportions can be off by some small units. But it works very well for aproximations, estimates and to calculate the tip or split the bill at the restaurant. It's also great to start conversations and has a vintage element reminding of the times when calculators didn't exist and everybody had to use a sliding rule for calculations. You can get it for $5 from PilotEssentials. This is a pen with a green led tip created for Pilots and other professionals that may need to write at night without losing adaptation to darkness. The light is activated twisting the tailcap, just the basic on-off-on-off without brightness levels. 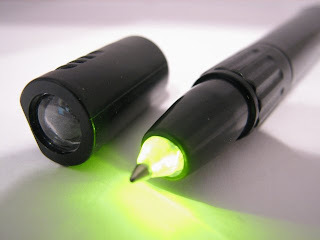 Without the cap the tip of the light can be used to see where you are writing, the green light is very dim and won't affect dark adapted eyes. Green is a good color since the human eyes will see many shades under green light and if you need to see a map you won't have a problem with red marked roads or other symbols. With the cap attached there is a small lens in the cap so you can use the pen as a small flashlight, the light is very dim and will be useful to check out a map, a list of instructions, flight plan etc. A good pen with a good selection of color and brightness for night notes. You can get it for $7 from Pilot Essentials.